The nomad life felt like a natural fit for Maya and Ryan. Back when they started, full-time RVing with relatives just wasn’t on their radar. 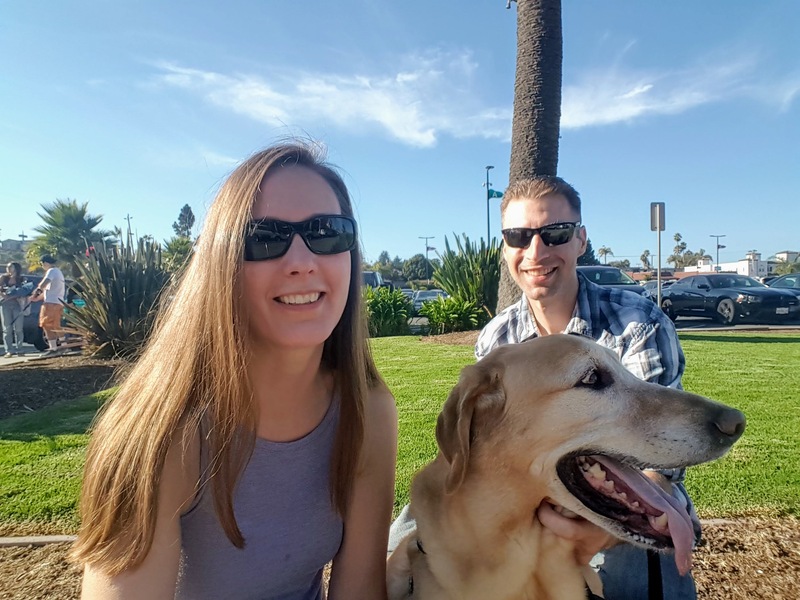 With a few years of travel under their wheels, things were rolling right along in a small Class C RV as they explored the U.S. and discovered ways to support their lifestyle. But when Maya’s mother’s health declined in 2017, everything changed for these minimalist lifestyle advocates. Today, the trio is traveling together and giving Maya’s mom a lifestyle that’s the envy of many home-bound seniors. Joan’s diligent daughter Maya visited and helped with her mother’s health challenges. But she needed a permanent solution. Joan would have to move closer to the family. Convincing her mother to switch lifestyles didn’t happen overnight, says Maya. The simple living evangelist and creator of The Gradual Minimalist lifestyle movement was forced to initiate long, challenging conversations with her mother about the benefits of downsizing and living closer to West Coast relatives. At one point Maya asked her mother “If you could travel anywhere on this continent, where would you want to go?” The answer: to finally meet her young grandchildren in California. Maya agreed the trip would be a good idea, but Joan would have to let go of her retirement property, become a Californian and live with her son. The idea wasn’t exactly met with enthusiasm. 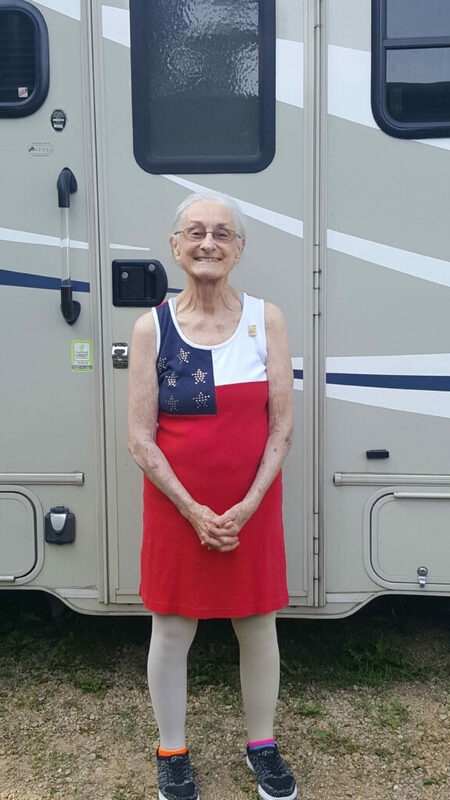 “I was unsure of how I would be able to adjust to it but after a little while on the road, it became easier,” explained Joan. Traveling from coast-to-coast introduced her to an unconventional lifestyle that she hadn’t ever considered. From Lake Erie in New York to the Oregon coast, the traveling family enjoyed an unforgettable adventure. On the road for the first time. 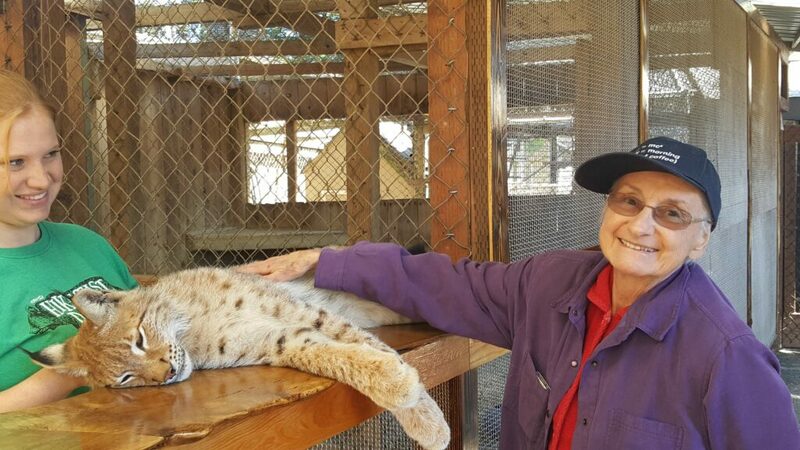 “My most favorite stop of all was the Wildlife Animal Safari Park, where Maya and I petted a baby leopard and other wonderful animals. The drive along the Oregon and California coastline, on our way to South San Francisco, was also magnificent. All in all, I am very happy that I saw such wonderful towns, cities and waters along the route,” says Joan. The path to sanity appeared in the form of a two bedroom, 1.5 bath fifth wheel RV. A better description would be the RV with a mother-in-law apartment unit. It was bigger and a totally different way of RV living from Maya and Ryan’s smaller RV. But the rig was a no-brainer with mom along for the ride. It’s a much larger rig than they ever imagined for themselves. But the size gives everyone on board enough space and privacy, whether they’re traveling to a destination or staying parked in a monthly spot. “I am never alone but I still have lots of privacy,” says Joan. 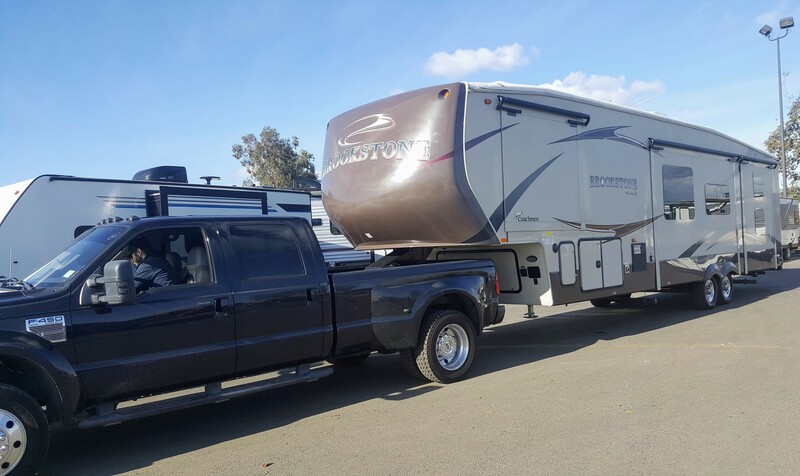 The fifth wheel with a Mother-in-Law apartment. Thanks for the great story, Renee. Thanks, Rene! See you next time on the road. Great Story and I hope mine turns out just like that. We now live in a apartment, 1 parking spot, with one car and one class A for sale and one Class B+ which is new to us. My new in house doctor is my wife and we have to get along or I’m in big trouble. The worst part about being old is ones health, mine is in the pits right now, Diabetes, “GP is not happy with my A1C though I keep trying every month to get it down for him, then I picked up ulcer in a bad place and was told be wound doctor that I cannot sit on regular seating and to buy or rent a Roho Pillow, wow this pillow removes the Pain instantly. The other problem is I cannot lay on my side long due to have a Subcontaineous Bruise in each of my two legs from the hip to the toes which causes a lot of pain when I try to sleep. I have found the best way to sleep is to sit up or raise my head slightly, then raise my feet up to lay out on the stool. I can do it this way for about 4 hours then I pop awake and that is it for the night, grab my Roho Pillow and go watch something I have taped, or read one of the many books I have to read before passing along. All I can tell you is don’t fall as it hurts like heck for a very long time. GP said in a off chance way they take up to two years to heal and I said I may be gone by then. Looks like were getting a new recliner that will do all the things I need to sleep. I would suggest reading “Bernstein’s Diabetes Solution” and “Atkins Diabetes Revolution: The Groundbreaking Approach to Preventing and Controlling Type 2 Diabetes by Robert C. Atkins M.D. | Mar 17, 2009” and look at Factor 75 and other low carbohydrate home meals. I brought my A1c under control by following their advice rather then the American Diabetes Association advice. It is hard so do it slow. However, the true answer to a sugar metabolism disease is to avoid eating sugars and carbohydrates (that the stomach is amazingly efficient at converting into diabetes). It is very similar to how an alcolholic can only be happy by avoiding all alcohol. Again, this was very hard and took me about 5 years. But it worked for me. An acquaintance said that to make a similar strategy work for him, his GP gave him home administerd shots that contained a substance that killed his appetite so that he could adapt to the very low carbohydrate diet. Wow, David you are 100% correct. Following Dr’s & dietician’s orders will not be enough to control diabetes. Their diets are so heavy on carbs and always you need extra insulin which makes you hungrier and it’s a vicious cycle. I don’t know how you can get off meds and do a drastic diet change by yourself, however. I am a nurse for 42 years, diabetes can be controlled, and it’s a painful slow death to not control it. Sadly, some of us did not grow up with loving parents.